Ever notice how when you sit still for a few hours without moving, you suddenly get up and find your legs are cramped, or asleep, or feel tense? That’s because they’re not meant to be still…at least not for long. We’re meant to move. Our limbs have to be in motion almost constantly. Humans have always been on the move. Our skeletons and muscle structures have evolved to facilitate gathering our food, escaping from predators, and to satisfy our animal curiosity. As our brains grew larger, so did our inquisitiveness, and driven by different reasons, humans began to travel. In the Neolithic age we saw the first sailing vessels and the invention of the wheel, both designed to move us around in different ways. 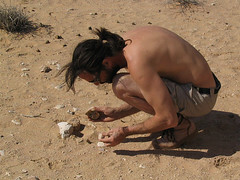 Nomadic hunters and gatherers moved in search of food following seasonally available wild plants and game. Then Ancient man began to build roads to facilitate the movement of troops through empires, and eventually civilians began to travel in caravans. Travel for the purpose of commerce and trade took explorers to strange lands to meet other people, and bring back riches of unfathomable value. Wealthy Greeks and Romans began to travel for leisure to their summer homes and villas by the sea in cities like Pompeii and Baiae. The freedom of travel in the Roman Empire brought many Jews to flourishing cities of the ancient world, and Jesus himself is thought to have traveled a great deal with his disciples. We know that Vikings had a particular skill for sailing and a keen interest in exploring. Through perilous voyages they conquered areas such as Iceland and Greenland, and were even the first to accidentally discover America in 985 A.D, when a ship was blown off course on the way to Greenland. In 1001, Leif Eriksson sailed back to explore it further and called it Vinland, or ‘land of pastures’. 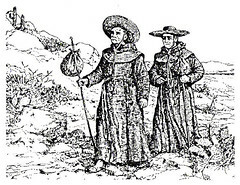 In Medieval times, the most notorious travelers were pilgrims and missionaries. Driven by their religious convictions, pilgrims made dangerous journeys to places like Santiago de Compostela, Canterbury, and Jerusalem while missionaries traveled to heathen areas to evangelize the people, such as the Celts in Ireland. In the late 16th century it became fashionable for young aristocrats and wealthy upper class men to travel to important European cities as a crowning touch to their education in the arts and literature, designed to enlighten Europe’s young elite. This was knows as the Grand Tour. London, Paris, Venice, Florence and Rome were visited by these grand tourists to expose themselves to the great masterpieces. The French revolution marked the end of the Grand Tour as was known, and with the coming of rail transit in the early 19th century, travel was revolutionized. Travel was no longer limited only to the privileged as it became cheaper, easier, and safer to travel. Young ladies began to travel too, chaperoned by an old spinster as was appropriate, as part of their education. The Industrial Revolution brought leisure travel to Europe. The new middle class now had the time to travel thanks to industrialized production with efficient and faster machinery. The new middle class, comprised of factory owners and managers, now had the time to travel thanks to industrialized production with efficient and faster machinery. They had more money and more time to relax and take part in recreational activities. For the first time ever, traveling was done for the sole pleasure of it. This was how Thomas Cook, in 1841, put together the first package holiday in history. He started off with tours in Britain but with his rapid success soon moved unto other European cities, where Paris and the Alps were the most popular destinations. Thomas Cook pioneered all the common services that travel agencies undertake for the passenger today: accommodation, travel tickets, timetables, attractions, currency exchanges, travel guides and tours. Air travel began after World War II, when a surplus of aeronautical technology and ex-military pilots who were more than ready to fly. Only the rich could afford holidays with air fare, whereby an all-inclusive two week holiday in Corsica cost around Ã‚Â£32 in those days. Affordable air travel soon contributed to international mass tourism, pretty much as we know it today. Over the years different developments in tourism have changed the way we travel, such as technology, safety and security, costs, social changes, etc. The Grand Tourists of the 17th and 18th centuries echo today of the hoards of backpackers and gap-year students who, not content with traveling through one continent, do so throughout the entire world. Much like the young European aristocrats of the time, we today also consider traveling as a rite of passage, an initiation, a transition, an opportunity for soul searching. With tourism currents like Eco-travel, Ethical Travel, Volunteering, Mystical tourism, Dark Tourism, Pop-Culture tourism, Cosmetic Surgery tourism, and Independent traveling, the travel industry has reached an apogee never before seen. So when we wonder why we travel, and where it all started, it might be comforting to think about our predecessors, and how they moved first out of necessity, then for religion, migration, emigration, commerce, enlightenment and finally for pleasure. Today each of our personal reasons may vary, but one thing is certain: there will never be rest for a species that can only move, move and keep moving. Lucia Byttebier left her life behind in Buenos Aires to travel the world with her boyfriend. Follow her adventures via her excellent travel blog.